Okay, so it's been awhile since I did some mosaic a days, so I thought I should work on﻿ a few for the next bit. I actually did this one in the summer, and it sold while I was working on it. I've had the jasper cabochon for a number of years, and finally figured out the perfect use for it. I'm really pleased with the outcome here. On another note, I'll be teaching a Mosaic a Day class in Texas soon at Tesserae Mosaic Studio. It's a fun and packed three days of learning all the tips and tricks I've discovered while working on this project. As well, I'm also teaching a Fine Scale Mosaic Jewelry course while there, two days of working really small with really great materials. 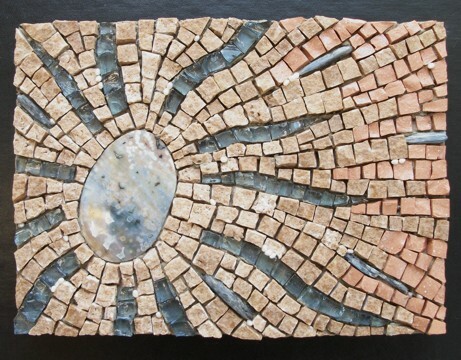 For more information, visit Tesserae Mosaic Studio. Nice use of jasper there. With the title of 'Radiate', I was concerned you might use some uranium ore.
Nice. If you teach in the States again, please let the folks on your newsletter (like me) know... thank you!